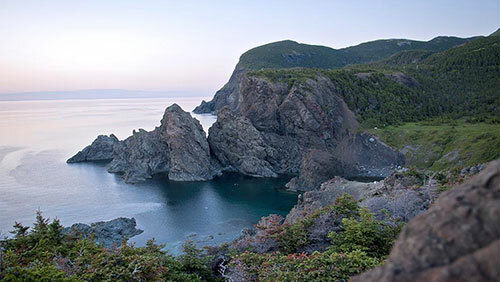 Nestled in the northeast corner of North America, Newfoundland and Labrador’s (NL) 17 campus locations feature an inviting lifestyle, which includes a moderate climate, clean environment, spectacular coastline, rugged mountains and friendly people. Known as Canada's most easterly province, NL has a population of 519,716 - the majority of whom reside on the island portion of the province. There are some 20,000 miles of rugged coastline, with hundreds of seaside communities in coves and deep bays. Labrador is the mainland portion of the province bordering with Quebec. Also known as “The Big Land,” Labrador is one of Canada's last remaining untapped frontiers of natural resources and beauty. It is nearly three times the landmass of the island portion of the province, with five per cent of the total population residing there. CNA has two campuses located in Happy Valley-Goose Bay and Labrador City. Happy Valley-Goose Bay, Labrador's hub, is a multi-cultural community and a military flight training centre situated at the western end of Lake Melville. The towns of Labrador City and Wabush in western Labrador form a large urban community based primarily on the mining industry. The remaining population is scattered along the coastline in 26 communities. The province’s capital city is St. John’s. Located on the southeast part of the island portion of the province, it is the historic commercial centre and also its largest city. The St. John's metropolitan area has a population of a little more than 205,000. The city is large enough to provide a full range of services, yet small enough so that the city exudes a sense of community. Two of CNA's campuses are located within the city, with the other 15 campuses located throughout the province. Recreation enthusiasts will love NL as it is a haven of activity. Its warm summers and moderate winters provide a wide variety of outdoor activities, such as golfing, downhill skiing, fishing, whale and bird watching, and hiking, to name a few. Locals and visitors are also in awe of the majestic icebergs that flow through “Iceberg Alley” in late spring, or the astounding beauty of our autumnal colours. For those who prefer the indoors, urban centres offer theatre companies, the symphony, modern and classical dance, art galleries, music festivals, and an exciting nightlife. Travellers to the province have the option of arriving by plane or by ferry. There are two international airports - St. John's and Gander - with daily flights from most major Canadian cities. Being the most easterly province also makes NL accessible for the international visitors from “across the pond,” a local phrase used to describe destinations located on the eastern side of the globe. Regional airlines serve the province through airports located in Happy Valley-Goose Bay, Gander, Deer Lake, St. Anthony, Stephenville and Wabush. The island of Newfoundland is linked to the Canadian mainland, via Argentia or Port aux Basques, through a ferry service with Nova Scotia.